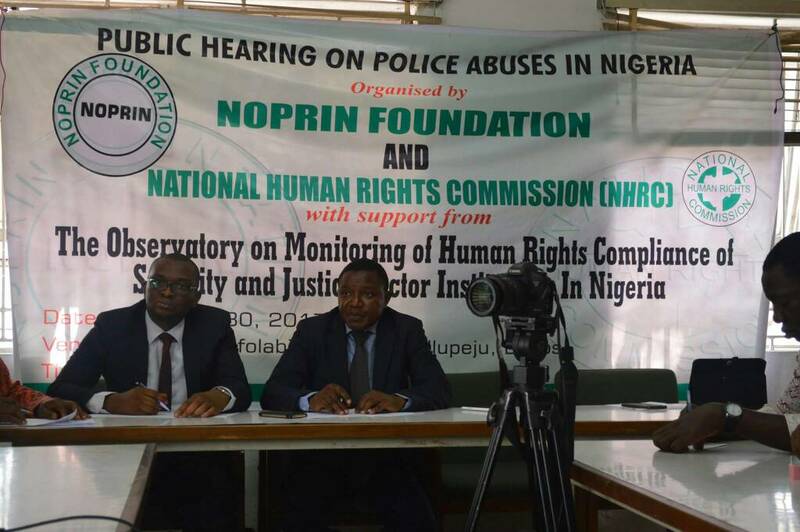 NOPRIN and the National Human Rights Commission, with the support of the Observatory on Monitoring of Human Rights Observance by Security and Justice Institutions in Nigeria, held a Public Hearing on Police Abuses in Nigeria, in Lagos on Monday October 30, 2017. The Public hearing was attended by over 30 participants including six victims of police abuses who testified; a Panel of three Human Rights Experts, members of other civil society organisations and the media. The hearing started with opening speeches by the National Coordinator of NOPRIN, Okechukwu Nwanguma; the Southwest Coordinator of the National Human Rights Commission, Lucas Koyejo; and the Lead, Security and Justice at PRAWA, Mrs. Ogechi Ogu. In 2014 civil society and the Nigeria Police collaborated to develop a new police-training curriculum to replace the outdated colonial police training curriculum which had been used for training in police training institutions. The old curriculum was devoid of any human rights content and the new curriculum set out to fill the gaps and to reform and upgrade it to international standards for law enforcement education. The Nigeria Police Force formally adopted the new training curriculum and the manual for use in police training institutions and for all levels of police training and retraining. The Inspector General of Police wrote the Forward to this Curriculum. Although the new Police training curriculum is exhaustive, encapsulating all the human rights principles governing democratic policing and law enforcement by the Nigeria Police, men and officers of the forces are still not in tune with the purpose and intent of the curriculum as human rights abuses by members of the Nigeria police have continued to be on the rise. The public hearing was therefore one of the strategies to assess human rights compliance by law enforcement agencies following human rights trainings based on the new training curriculum. We believe that feedback from citizens who have direct contacts with the police on daily basis is one of the key indicators of compliance or lack of it. The Public Hearing was therefore an opportunity for victims or their representatives to testify before a panel of human rights experts. A 27 year old male narrated how he bought a 1999 model of Toyota Siena car from a car dealer in Port Harcourt for which he had a balance of N10,000 to pay. The car dealer’s stern demand for the balance turned to threats and finally police arrest. He was detained at the Olusegun Obasanjo Police Command in Port for a day and later transferred to Benin City in Edo State for a day and finally to Obada in Ogun State where he was held in detention for over two weeks. In Ihejirika’s narrative, he was beaten, maltreated and his family members were exhorted to the tune of over N170,000, part of the money of which was through electronic bank transfer to one investigative police officer known as Scorpion. He tendered accounts details to buttress his claims. During this ordeal, he was not allowed to contact his lawyer of family member. He was finally released after two weeks in detention and without any explanation. His humble request is for the police to release his car and refund the N170, 000 extorted from him and his family. Complainant may initiate Fundamental Rights action to recover car converted and other properties. NOPRIN and other CSOs should initiate advocacy or campaigns to hold DPOs responsible for violations in their police stations. A 43 year old female and an Administrative Officer with Afri-Invest, Lagos was arrested by the police on the accusation by her boss, Mrs. Abiola Ojo-Sanni that she stole about $50,000 from the office while she travelled. Her case was curiously transferred from Ikoyi Division to Anti-kidnapping, Panti. Her complaint is that while in detention, the police extorted various monies from her family and her colleagues who were also detained along with her. Her younger sister and the wife of one of the co-detainees were sexually harassed by men of the Anti-kidnapping Unit. Her case which attracted wide media attention led to the new Lagos Commissioner of Police to set up an investigative panel, the report of which is yet to be made public. Her request is that having been found innocent she ought to be cleared by the police and restored back to her job. Police reluctant to conclude investigation/ exonerate or charge complainant resulting in violation of right to fair hearing, dignity of human person. NHRC should write DPO in charge of Ikoyi police station requesting update on complainant’s case. Letter should be copied the commissioner of police, Lagos. A staff of an environmental rights NGO, Chime went to observe the shelter rights abuses of residents of Badia, Lagos. While he was trying to take photographs, the police violently arrested him and pushed him into a waiting Black Maria. He was thereafter taken to the Oshodi office of the Task Force along with other residents of Badia whose houses were demolished. He was made to delete the photographs he took of the demolitions and later released on the same day after he was made to enter an undertaking, on behalf of himself and other detainees, not to record scenes of demolition again. He submitted a memo to the Panel of a Report by Spaces for Change. Harassment and intimidation resulting in violation of the right to dignity of human person. NHRC & NOPRIN should, work with S4C to bring the memorandum submitted by the Complainant to the attention of the Attorney General of Lagos state and the Commissioner of Police, Lagos state and impress on them the need to adopt the framework already developed by S4C for moderating the role of police officers during conduct of eviction exercises; and a positive change in police-civilian relations in Nigeria. As noted in the Memorandum submitted by S4C, ‘incidents of police brutality during eviction exercises are too far numerous… and attended by security task force (mostly comprised of police officers) with a prejudiced stance of tackling crime. This is the fundamental cause of the aggression displayed by police officers during such exercises….’ Many citizens have attested to incidents of brutality by the police during evictions leading to deaths, injuries, threats of assault, psychological trauma, among others. A 36 year old woman was arrested by men of the Intelligence Response Team at the Lagos State Police Command Headquarters on July 14, 2017 at Igando, Lagos State. According to her, she was arrested in lieu of her husband whom the police alleged was an accomplice to Evans currently being tried for various kidnapping cases. She told the panel in tears how she was violently manhandled in the process of arrest and taken into detention at the Lagos State Police Command. While in detention she was beaten with all sorts of materials, verbally and physically assaulted to the point of coma. The police officers who carried out these acts according to her included one Philip, Christian and Idowu. She received serious injuries to her forehead, scars of which she still carries. Her husband, thinking it was a case of kidnap reported the case to the Igando Police Station. She was later led by the police to arrest her husband at their home in Igando and the husband, Linus Okpara a Civil Engineer is still being held at the Lagos State Police Command for over three months. At the time of her arrest, Mrs. Okpara was nursing a baby who was delivered prematurely. But the police ignored this and still took her into detention for over two weeks. The police collected N50, 000 from her brother purportedly to release her. The police took her to their home and collected the few valuables they could lay hands on, including a rechargeable fan, ladies handbags which she sells and the husband’s car. A Toyota Camry, 1999 model. They further collected N40, 000, N5, 000 and another N20, 000 from the husband. Her sister was threatened and intimidated at the police command and N1.000 collected from her. On august 9, the police demanded another N170, 000 out of which N100, 000 was given to them. Her humble request is for the release of her husband, whom they have refused to give bail or arraign in court for whatever alleged offences. Her major worry is her husband’s poor and deteriorating state of health which the police themselves acknowledged and are offering minimal medical treatment. He is asthmatic and has a growing hyena for which he was preparing for surgery before his arrest. Beating/unlawful detention of complainant, extortion of complainant, conversion of property of complainant, continued unlawful detention of complainant’s husband without charge resulting in violation of rights to personal liberty, dignity of human person, fair hearing and right to property. NHRC & NOPRIN should bring the prolonged detention of complainant’s husband to attention of the AG Lagos state and the Chief Judge of Lagos. The prolonged detention clearly violates the Constitution and Lagos state Administration of Criminal Justice Law. Complainant’s husband should be either released unconditionally or charged before a court of competent jurisdiction. Complainant can initiate Fundamental Rights action for beating/unlawful detention and recovery of converted properties. A 49 year old male narrated his ordeal in the hands of men of the Nigeria Police Delta State Command Asaba. He lives at Ejigbo in Lagos and was arrested and detained in Asaba when he reported that his account was frozen by his bank on the allegation that the sum of N600, 000 was illegally transferred to his account. Although he offered to return the money to the person who paid the money into his account, he was still arrested and held in custody in Asaba. Curiously the police investigated and found that he was defrauded by a business partner and the two persons who allegedly committed the act were also arrested by the police. He was arraigned in court at Asaba. His lawyer defended him and when the Magistrate found no case against him, he was ordered to be released by the police. However, in contempt of the court order, the police rearrested him as he stepped out of the court and he was again taken back into detention where he spent several weeks. While in detention he was made to pay N80, 000 to be kept in a special and more ‘comfortable cell’. He narrowly escaped food poisoning and under the circumstance his friend was made to write an undertaking on his behalf which he was forced to sign before he could secure his release. His request is that the bank should unfreeze his account, the various monies extorted from him by the police returned and for the police to obey the court order on the case. He is still living under fear and serious threat to his life and can no longer sleep in his house. He now sleeps in various churches every night. Beating/unlawful detention of complainant, extortion of complainant, denial of access to bank account resulting in violation of rights to personal liberty, dignity of human person, fair hearing and right to property. Delta state Police Commissioner, Assistant Commissioner (Abayomi Peters Oladipo), the PPRO (Andrew Anichebe), the IPO (ASP Joseph) and the Police Prosecutor (Tessy Tiokpu).